A Bible Belt state legislator who backed a pro-Israel resolution hopes more states will follow. “G-d’s promise to Jews is forever." There are other verses that are not open for interpretation, and two South Carolina senators this year succeeded in using them to help gain unanimous state legislative support for the first-ever pro-Israel resolution in a state. and Whereas, as the Grantor of said lands, G-d stated to the Jewish people in the Old Testament; in Leviticus, Chapter 20, Verse 24: 'Ye shall inherit their land, and I will give it unto you to possess it, a land that floweth with milk and honey.'" 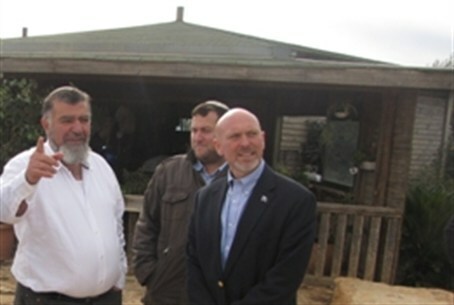 Resolution co-sponsor Rep. Alan Clemmons, on his first-ever visit to Israel, visited Samaria this week and spoke with Arutz Sheva, which asked him why a Bible Belt state legislator – a Mormon, no less – is so interested in Israel while the “Jewish vote” is minimal in his state. As a Mormon, Rep. Clemmons is aware of concerns by many nationalists that "Christian Zionists" are on a secret mission to convert Jews. “Israel is a special place for all Christians, and Jews have a right to be concerned with Christian persuasion and influence,” he replied. “When it comes to Israel, abuse and injustice in the name of religion have worked against the Jews for millennia, but if there is any thought of missionary activity – there is none. I am not interested in converting Jews. I am here to support Jews."